At Kathy Shore Nursery we are dedicated to providing you with the best quality greenery products. We feature carefully cultivated and maintained Fraser Fir, White Pine, and Concolor Christmas Trees as well as a beautiful collection of greenery accents ranging from Luxury Christmas Garland to beautiful Fresh Christmas Wreaths. Our team strives to provide you with beautiful pieces to decorate with throughout the holiday season. 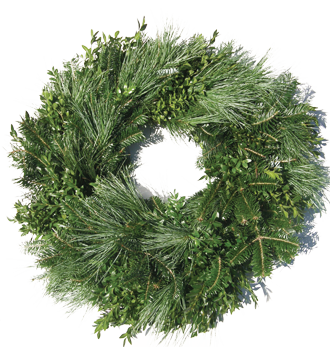 Traditional Christmas Wreaths are often made using Fraser Fir boughs. At Kathy Shore Nursery we offer not only the classic Fraser Fir Christmas Tree Wreath, but we also offer Boxwood wreaths which add a unique touch during the holidays. We also feature a beautiful mixed wreath, which combines the beauty of the Fraser Fir and Boxwood Wreaths with White Pine Christmas Tree boughs to create a truly special wreath. The Mixed Wreaths are wonderful for hanging on your door, along your windows, or hanging above the fireplace as a compliment to your North Carolina Christmas Tree. Kathy Shore Nursery will palletize your order of Wholesale Christmas Wreaths, saving you money and keeping the Fresh Christmas Wreaths in pristine condition. If your church or civic group is thinking about a fundraiser, call us today for more information on Christmas Wreaths for Fundraising or Carolina Fraser Fir Fundraisers! Kathy Shore Nursery in the Blue Ridge Mountains offers the best North Carolina greenery you will find!